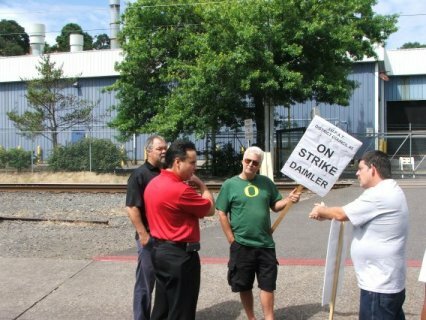 IAM Western Territory General Vice President Gary Allen and IAM District Lodge W24 President/Directing Business Representative Chip Elliott talking with Machinist members on strike at Daimler in Portland, OR. With the strike at the Daimler Trucks North America plant in Portland, OR going on its third week, members of IAM Local Lodge 1005 continue to hold the picket line as talks between the IAM and company representatives resume. As reported in the Northwest Labor Press on July 2, members of Machinists Lodge 1005 voted down a contract offer from Daimler Trucks North America and went on strike at 12:01 a.m. July 1. One of the main issues for members was the wage and benefits package that was part of the company’s “last, best, and final offer.” Wages have been frozen over the last four years and workers still increased plant productivity by 25 percent. Daimler workers feel that the financial sacrifices they made deserve recognition by the company, whose profit margin has steadily increased over the same period. For the latest information on the strike at Daimler visit the IAM Local Lodge 1005 website: http://www.iamll1005.org/ and click here and here for photos.